It’s so nice receiving the actual Topbox a day after receiving the shipping email! That’s because I believe it was shipped out from Vancouver. Fast shipping is always a plus :). – When I first saw this, I thought, where are the bristles for this brush?! Then I realized that it was a tiny lip brush. I usually just wear lip balm or lip gloss, so this lip brush is not really something I would get that much use out of. If I received an eye or face brush, I would definitely use it more. 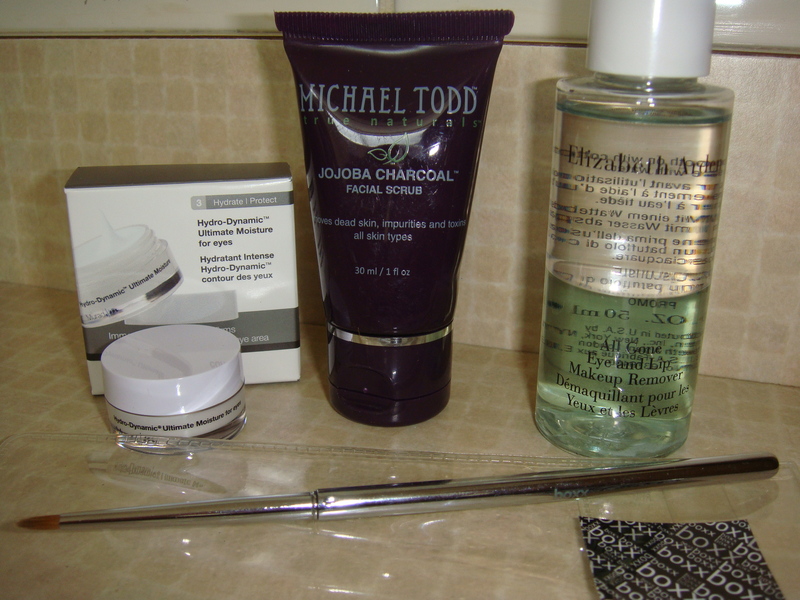 – I am already committed to a particular eye makeup remover that works perfect for me. I will definitely give this makeup remover a try though to see how well it removes everything and if it leaves a residue. In my opinion however, I don’t think including a makeup remover should count as a product! I’d like to think that I am subscribed to try and test out different beauty/makeup products to externally put on the skin to create a difference in my appearance and I feel that makeup remover does not fit in that category. – I have never tried anything from Michael Todd, and you can never go wrong with more facial scrubs. I must say that I don’t regularly use facial scrubs, but I know the importance of them and I will see how good this one works. – This is a nice little travel sized eye cream. This cream is supposed to moisturize for “immediate and long term relief from dryness.” I do not normally have dryness under my eyes, but it is important to use an eye cream to prevent wrinkles! I am excited to try this. These are all decent products that I will give a try and make use out of. The only product that I can’t see myself using is the lip brush! I know that others received an eye/face brush which I would have loved! Oh well. What did you receive in your April Topbox? The only thing I got the same as you is the scrub. Lots of variety in boxes this month! Next Post Words to live by.